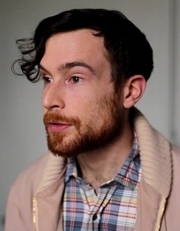 Nate May is a Cincinnati-based composer whose music draws on research and imagination, often treating contemporary issues of place, migration, environment and identity with textural intricacy, rhythmic drive and a taste for repurposed sounds. Raised in Huntington, West Virginia, much of his work stems from a “fascination, love and respect for the people” of Appalachia (Soapbox), including his oratorio State, premiered by singer Kate Wakefield, Cincinnati’s Women’s Choir—MUSE, and a percussion ensemble in April 2016, and his monodrama, Dust in the Bottomland—set in present-day West Virginia and sung by lyric bass Andrew Munn—which has been performed 12 times in seven states and broadcast on radio and television. Large-scale collaborations include the world-touring work Spiral by choreographer/dancer Wanjiru Kamuyu and Kalahari Waits, the debut album of indigenous poetry and music trio Khoi Khonnexion, produced during a year in South Africa. Trained in piano improvisation, he has played in the bands Baby Houdini and Firemaggot and with Anna Roberts-Gevalt of the old-time duo Anna & Elizabeth. He holds degrees from the University of Michigan (B.F.A., Jazz and Contemplative Studies) and CCM (M.M., Composition), where he studied with Geri Allen, Ellen Rowe, Stephen Rush, Miguel Roig-Francolí and Michael Fiday. His work has received support from the Telluride Association, ArtsWave, People’s Liberty and the Berea College Appalachian Sound Fellowship. BFA, University of Michigan, Ann Arbor, MI, 2011 (Jazz and Contemplative Studies). MM, University of Cincinnati College-Conservatory of Music, Cincinnati, OH, 2016 (Composition).